We’ve already shown you the Flowmaster FlowFX exhaust kit for the 5.3-liter V8 2019 Chevrolet Silverado and 2019 GMC Sierra, which offers a ‘Moderate’ interior sound level but an ‘Aggressive’ exterior sound level, according to Flowmaster’s own volume rating scale. Now it’s time to show you the more aggressive Flowmaster Outlaw exhaust kit for the 5.3-liter V8-powered 2019 Chevrolet Silverado and 2019 Sierra. This system offers an ‘Aggressive’ sound level both inside and outside of the cabin, ensuring you, your passengers and anyone within shouting distance is well aware that your truck has an aftermarket exhaust system. This particular kit is designed for the 2019 Silverado 1500 and 2019 Sierra 1500 Crew Cab and Double Cab with the 5.3-liter V8 engine. It does not fit Crew Cab two-wheel drive models with the two piece driveshaft and it won’t fit any 2019 Silverado 1500 or 2019 Sierra 1500 with a factory dual exhaust. 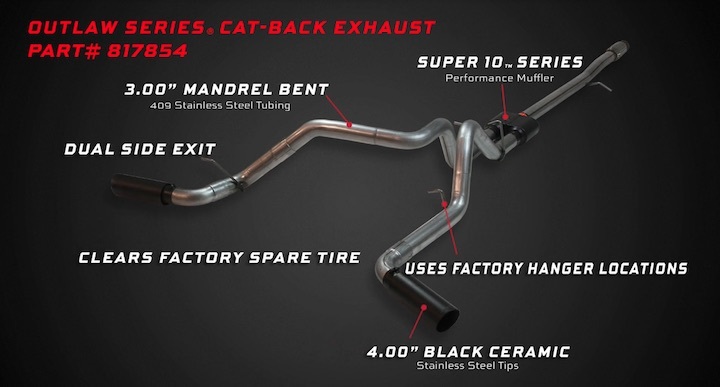 The kit comes with a stainless steel ‘Super 10 Series’ Flowmaster muffler, mandrel-bent stainless steel tubing (which can mount to the the factory hanger locations) and 3-inch stainless tailpipes. As you’ll see/hear in the video embedded above, the Outlaw exhaust system is extremely loud, resulting in an unhinged, almost raspy-sounding V8 roar that will probably have pedestrians thinking a Camaro is coming down the road before seeing your big V8 pickup. The company provides sound clips taken from both inside the cabin and out of it, so you will definitely want to check out this video if you’re considering an aftermarket exhaust for your new General Motors truck. Like this story? Be sure to subscribe to GM Authority for more Chevrolet Silverado news and GMC Sierra news.